Going to Fascia’s reminds me of going to a really good Connecticut brewery. You exit the highway and drive to a somewhat blighted industrial area and park at a non-descript beige and brown building. But once inside – hoo boy – it’s magic. The Fascia timeline is pretty interesting. Started in 1964, John and Helen Fascia began making chocolate pops and nut clusters in their basement (location #1). In 1977 they opened a retail store on Meriden Road (location #2). In 1985, they tripled their square footage with a move to Wolcott Street (location #3). That lasted all of five years, as they moved to Industry lane and its 2700 square feet in 1990 (location #4). Phew, now I’ll go enjoy some chocola- what? They weren’t done yet? They expanded that Industry Lane location 3 times by 1998? And enjoyed life there for ten years before the building was sold out from under their feet, forcing them to move back to a half-as-big space in 2008? (location #5) Luckily they were done moving, and – shut up. You’re kidding me. But they expanded location #5 in 2011?! No? Not good enough? Nope. They moved again in 2013 to its new home on Chase River Road (location #6) where they will surely last until the end of time. I relay that timeline to show that Fascia’s is Dirty Water for life. Six moves in 50 years and they always kept it real. Respect. 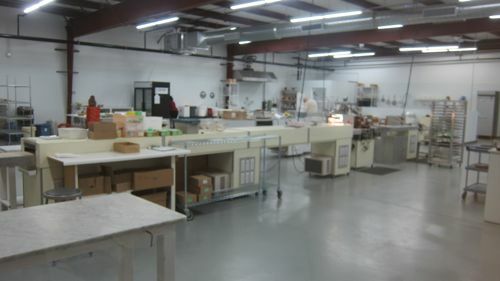 In 1964 John & Helen Fascia began making candy in their Waterbury, CT home to supplement John’s work in a local factory. With three young daughters helping out, Fascia’s Chocolates became the family’s full time passion and eventually moved the business out of their home. Almost half a century later, the entire Fascia family still makes all products in-house and in small batches to ensure the highest quality and freshness possible. With over 100 varieties of chocolates, fudge, peanut brittle, molded novelties and much more, chocolate lovers will be sure to find something that they will call their favorite. 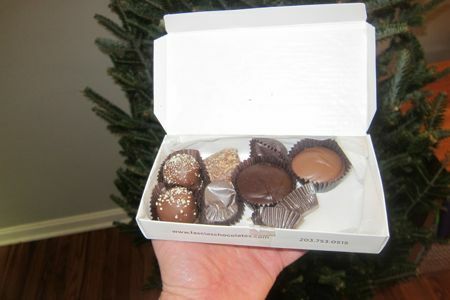 Connecticut Magazine’s “Best Chocolates” of 2012, Fascia’s also offers Kids BIrthday Parties, Truffle Making Classes, Group Tours, Workshops and Private Events. Fascia’s certainly has one of the biggest, nicest, and most interesting retail spaces on the Chocolate Trail. There is seating and a gelato bar and the counter-workers have always been unfailingly nice every time I’ve been in. 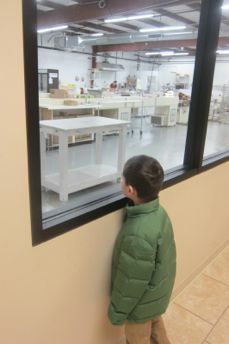 But aside from all that, Fascia’s has a hallway with big picture windows that allow visitors to view the chocolate-making process. Even Damian found that to be pretty cool for a few minutes. The same hallway contains all sorts of Fascia history in glass cabinets on the wall. I found that to be pretty cool for a few minutes. 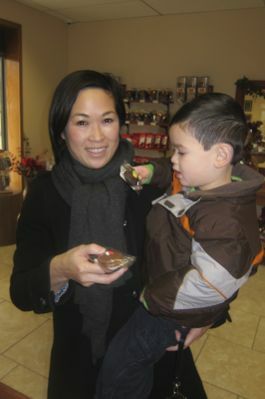 Hoang and I picked out some chocolates for us while the boys settled on their go-to: chocolate covered Oreos. 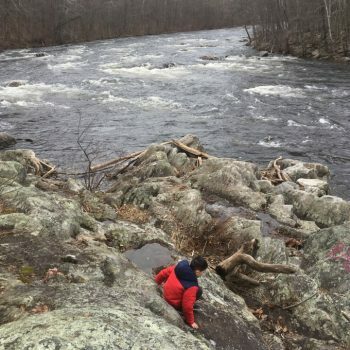 Calvin made quick work of his (of course) while Damian took the circuitous Damian route. He took a bite and then held on to the cookie. We left and he held on to the cookie. We went to our friends’ house and had lunch. 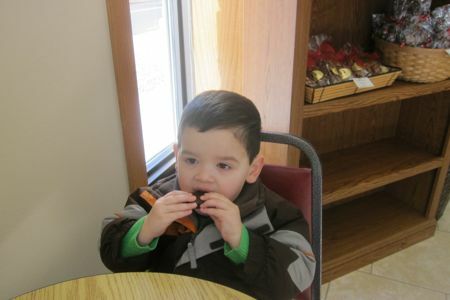 Damian held on to the cookie. 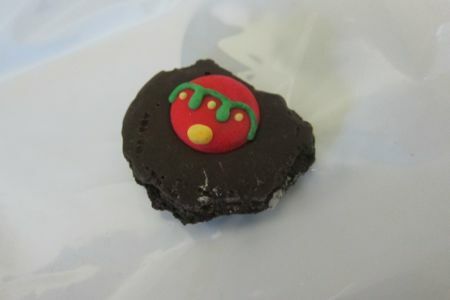 90 minutes later, we went home, with Damian still holding the cookie. Sigh. He never ate it, but wanted to keep it as if it were a toy. I love that kid. I really like Fascia’s. They have a ton of variety and like I said, it’s a really nice retail space. 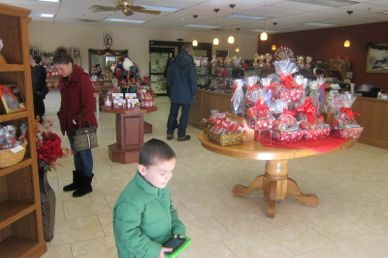 The “variety” is pretty much the standard independent chocolate shop fare, but it’s all done very well. Also, I’ve seen kids having birthday parties there and they seem like a lot of fun – they kids make their own chocolates and stuff like that. 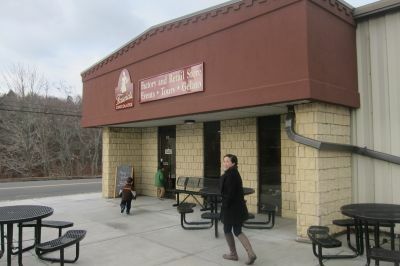 Fascia’s is located right off of route 8 (for now) in the north end of Waterbury (for now). And you should go there.